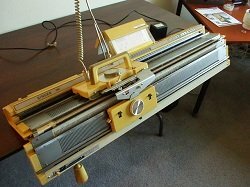 Many hand knitters feel that using a home knitting machine is cheating because they tend to think the machine does all the work. This however, is not true. That is much like saying a sewing machine is cheating. The knitting machine is just another tool. A machine will not create an item, it just helps you to create it faster. You still have to have your imagination and work the stitches and patterns to create your finished project. 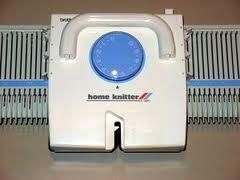 I use the Brother knitting machines but many like the basic Bond knitting machine. There are many brands to choose from. Some other brands are the Silver Reed, Artisan, Studio, Juki, Empisal, and Singer just to mention a few. 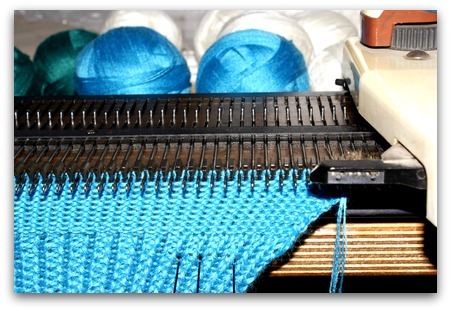 Most knitting machines available to the general hobbyist require a great deal of hand manipulation to individual stitches to create a patterned or textured fabric. But there are some out that have punch cards or computers to help the creation of patterns, and different stitches. The main difference however is that on a home knitting machine all the stitches are manipulated first and then the carriage is slid across the needles, working the entire row of stitches at once. This differs from hand knitting where each stitch is manipulated individually and then immediately knitted. On the knitting machine, whether it is manual, punch card or computer, the needles for the entire row are placed into position and than the carriage is pulled or pushed across to knit the row in one motion. Under the hands of a skilled machine knitter almost any hand knit pattern can be translated and knitted on a flatbed machine. Many believe that only flat items may be knitted on a machine. This is not true. You can knit sweaters, hats, booties, slippers and just about anything you can think of, on a machine. There are however a few machine knitting techniques that would be very difficult for a hand knitter to replicate but not many. Some techniques however can be extremely tedious to knit on a machine and are best or easier to knit by hand. As with hand knitting you can find free patterns online to help you get started. You will find forums to help you with any questions you may have. The best thing about machine knitting is you do not need to know how to hand knit to be able to use a machine. 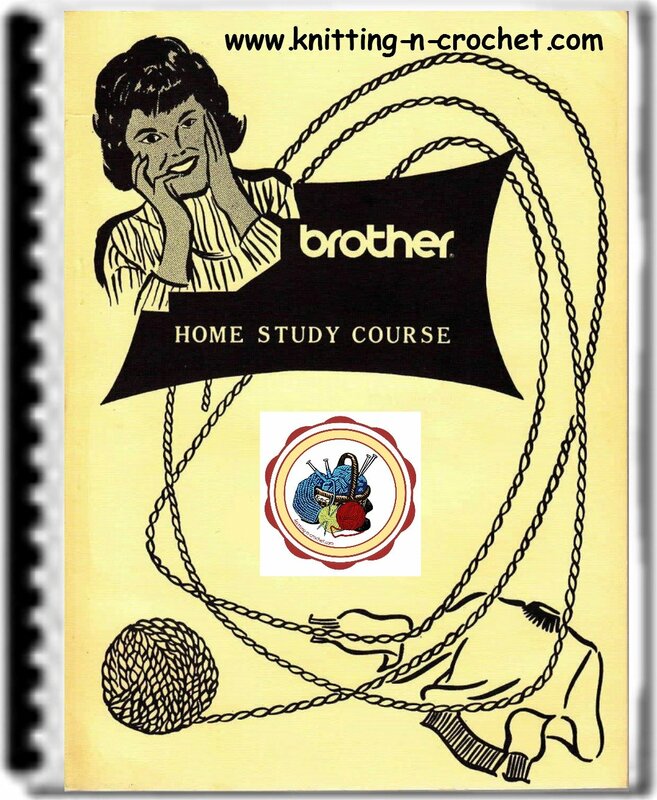 Of course it helps to be knowledgeable in the stitches and such, but it is not necessary. The machine does most of the work but you will need to cast on and bind off, which is different on a machine than it is with hand knitting. You can create a sweater in a matter of hours instead of weeks. You can do many different patterns and stitches. You can do ribbing if you have a ribber attachment or a mock rib if you don't. You can make cable stitch, weave stitch, and you can do lace. With todays home a knitting machine working with many colors is not a problem.